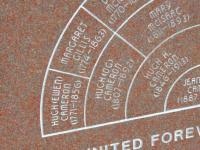 Biography*: John MacFarlane was one of the first of his family to be born in Nova Scotia. His grandparents, Dougald MacFarlane and his wife Margaret MacDonnell, progenitors of the MacFarlanes of Nova Scotia, arrived from Scotland with their extended family in Pictou in 1801 aboard the ship DOVE. Dougald was at this time about 80 years old. They rented a farm for a short time at Antigonish Harbor then settled at South River, Antigonish County about 1803 or 1804. Dougald's son Archibald settled on a homestead about two miles south of his father. It was here in 1804 that John, the oldest son was born to his parents Archibald (son of Dougald and Margaret) and Margaret Gillis. In 1822 Archibald and his brother John moved with their families to the Margaree area of Cape Breton Island. John moved to Margaree Harbor while Archie settled in South West Margaree on what became known as the Chapel Farm. John, Archie's son, now about 18, went with him. certain knowledge and mere motion, have given and granted, and by these presents, for Us, Our Heirs and Successors, do give and grant unto James Gillies, James Gillies, Donald Gillies, Angus Gillies and John McFarlane all of Sydney in the County of Cape Breton Yomen, one thousand acres of land situated lying and being in said County in the several lots and parcels herein described, that is to say... To the said John McFarlane Lot number thirty four on the East side of the South West branch of Marguerite River bounded by a line beginning at an Elm Tree on the bank of the River at the South West corner boundary of Lot number thirty three running by the magnet (in the year last aforesaid) South sixty five degrees East one hundred chains more or less to the general rear line of the front range of Lots, thence South fifty degrees West ( in the year of our Lord one thousand eight hundred and thirty four) twenty two chains and seventy links more or less till the South side line be thirty chain measures at right angles from the North side line thence North sixty five degrees West ( in the year of our Lord one thousand eight hundred and seventeen) one hundred and two chains more or less to the River, thence the course of the River down stream to the place of commencement containing Two hundred Acres more or less agreeably to the annexed plans. assigns, shall, and by the acceptance of this Grant he and they do severally bind and oblige themselves, to sow, annually, a proportionable part of the lands hereby given and granted with Hemp and Flax Seed. GIVEN under the Great Seal of our said Province of Nova-Scotia. WITNESS our trusty and well-beloved His Excellency Major General Sir Colin Campbell KbB"
Thurs. 9 th Feb., 1837. - A petition of JOHN MCFARLANE , of South West Branch of Margaree River, cape Breton was presented by MR. W. YOUNG & read , stating his having erected a Grist & Shelling Mill at that place with kiln for drying Oats , that the floor of the latter being Hardwood, had taken fire whereby the kiln was destroyed , & praying a grant of a sum of money to enable him to erect a kiln with Sheet Iron flooring. The 1871 Canada Census returns give a view of John's holdings. Land totaling 530 acres held one dwelling house, two barns or stables, two carriages or sleighs, three carts, wagons or sleds, four plows or cultivators, one horse rake, one threshing machine and a fanning mill. The Return of Cultivated Land tells us John had improved 150 acres, with 115 acres in pasture. One quarter acre was in gardens and orchards. Two acres of wheat yielded 30 bushels of spring wheat. In addition the land had in the past year yielded nine bushels of barley, 150 bushels of oats, 450 bushels of potatoes, 30 tons of hay, 10 bushels of apples and 12 pounds of maple sugar. Live stock and animal products seem to have figured prominently in John's calculations. His production of these products exceeds that of any of his immediate neighbors. In 1871 his farm contained or produced two horses over 3 years old, two colts or fillies, two working oxen, thirteen milch cows and fourteen other horned cattle. In addition the farm contained 60 sheep and eight swine. Five cattle, ten sheep and three swine were killed or sold for slaughter or export. Seven hundred ten pounds of butter and four hundred thirty pounds of home-made cheese were produced, as was eighty-eight pounds of wool and eighty-nine yards of home-made cloth and flannel. In addition the farm accounted for twenty muskrat skins. The Return of Products of the Forest tells us that John's farm produced fifty-two cords of fire-wood. Then as now the Margaree River helped to provide. John reported that he had eighteen fathoms of nets and seines of all sorts which allowed him to produce one barrel each of salmon, eels and trout. In 1888 it and that of his brother Angus were described as the best looking farms in North Inverness. John and his family did not achieve this level of prosperity without reverses. "He met with many losses in his early days of housekeeping. In the space of three years he lost by fire two beautiful houses, a large barn full of hay and wheat, together with eighteen head of cattle, and a pair of horses. He was always remarkable for his coolness and discretion. When his last house was burned he was working in the woods and hurried home with his broad axe on his shoulder. When assured of the safety of his family from the flames, he turned to the few people present and said 'plenty of wood in Cape Breton to make another house'. John along with his brother Angus, who had a grant of land next to him, erected the first grist mill in the area. Angus was ever after known as 'The Miller'. It appears that along with his other concerns, John took an interest in politics. "He was the confidential crony of the late lamented Sir Wm. Young in his campaign in this county and was the leader of the 500 Scots who marched into Cheticamp in 1832, with their banners floating in the breeze, and the sound of the pibroch rending the air, stirring the hearts of the gallant sons of Albion, but also terrorizing the sons of Gaul, there was no resistance given. The day passed quietly, and on the poll being closed, Young was elected and Smith defeated." John appears to have been a Christian in deed as well as word. "His home was the home of the poor, he was a man of few words, and many deeds, to the needy, the widows, and the orphans, he delighted to give; and with the sorrowing he was an everready sympathizer. As a citizen he did his duty conscientiously, faithfully and without ostentation. As a Christian he was always at the post of duty, and everready to do and give for the good of the church and his fellow man; and as a husband and a father while strict to duty and true to conviction, he ruled in love, with that beaming kindness and cheerful attention, that made home a great blessing, an earthly attraction to his family. According to the 1871 Canada Census John could read and write. to enable him to erect a kiln with Sheet Iron flooring. 1871, East Lake Ainslie Census District, Margaree, Inverness, Nova Scotia, Canada, The 1871 Canada Census returns give a view of John's holdings. [S781] J. R. Reid, "Descendants of Angus Gillis (Little Judique)", page 7. [S341] Registration form to Gathering 2001 Committee, August 3, 2001, Sheet 4. [S701] Certificate, see memo marriage of 1862-1908, McDougall-McFarlane 1884 February 5. [S124] The Casket, DOF, issue 61-1913-37-2. [S131] MacFarlane, John #32, 1834 Land Grant Nova Scotia Land Records, Grant Books I-V, New England Historic Genealogical Society. [S810] 1861 Digital, unknown repository address, Library and Archives Canada. [S341] Registration form to Gathering 2001 Committee, August 3, 2001, Sheets 2, 69. [S224] DOF - August 28, 1913, Gillis [Oban], August 28, 1913, page 27. [S719] Land Grant to Dougald MacFarlane, et. al. Grant Book A, page 109, Nova Scotia Provincial Crown Lands Record Centre. [S783] JR Reid, Ancestors of Donald James MacFarlane #0001, page 3. [S341] Registration form to Gathering 2001 Committee, August 3, 2001, Sheets 47, 69. [S341] Registration form to Gathering 2001 Committee, August 3, 2001, Sheet 47, 69. Biography*: His birthplace is said to have been Druim Lighart. Druim Lighart is a site not marked on the Ordnance Survey map, but it is close to the line of the modern West Highland Way as it swings past Inveroran and on towards Victoria Bridge and the old military road to Glen Coe. When Dougald had finished his school days in "Gleann Urchaidh" he left home and shaped his course toward the north and west. He was soon engaged as schoolteacher in one of the districts of Knoydart. While in this situation the blue eyes of a neighboring Cloe took possession of his imagination and inspired his day-dreams. Margaret MacDonell, who had made him her captive, was possessed in her proper person of the graces and goodly gifts that generally play havoc with the mental fortifications of bards and pedagogues. Besides, she belonged to one of the best families in the district; she was a daughter of "Fear Chrolem", and granddaughter of the Laird of the Scots - septs of the Glengarry family. She was a sister to the famous Colonel John MacDonell, "Spanish John" as he was called in Canada, who died in Cornwall, Ontario, in 1820. Dougald MacFarlane was married in Knoydart, Scotland, to Margaret MacDonell, and was received into the Church at the same time." Conditions aboard the emigrant ships were seldom better than abominable - - -. In the summer of 1801, George Dunoon advertised the sailing of the Sarah and the Dove from Fort William to Pictou. Had the laws then governing slave-ships applied to these emigrant vessels they would not have been allowed to carry more than 489 passengers. Dunoon filled the tiny holds with 700, emigrants from Lord Reay's country, from the clan-lands of Seaforth, Fraser and Cameron. If they believed his promise that in Nova Scotia they would find a tree that supplied fuel, soap and sugar (he probably meant the maple) they may have found the nightmare voyage endurable, but it is unlikely. Forty-nine people died on the Sarah alone, and the suffering of all was so terrible that it was remembered in Nova Scotia for more than a century." "He [Dougald] and his family came to America in the year 1801, in the "Dove of Aberdeen". The parents, with the younger members of the family, remained at the Gulf, while the grownup boys were preparing a home for them at the South River. They had a family of four sons and five daughters. [S149] Drummer on Foot, September 25, 1913, page 33. [S505] Dougald McFarlane to John McFarlane, Book 2, pages 278-279. [S152] Rennie McOwan, "Fair Duncan of the Songs." [S150] John Prebble, The Highland Clearances. [S285] Antigonish County, NS Index to Deaths 1864-77 Antigonish Heritage Museum. Biography*: Iain/John MacFarlane, Gentleman, who was born circa 1590 in Scotland. He was mentioned in the Privy Council minutes on 10 March 1619 and 25 March 1619 as a party to the feud with the Buchanans." At her home at West Lake Ainslie, March 2, after receiving the last rites of the Catholic Church of which she was a devout member, Catherine, beloved wife of Alexander Cameron in her 63rd year. 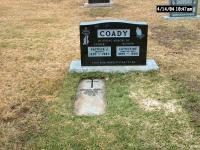 She was the daughter of the late Alexander MacDonald (Capt. Sandy) and Annie MacFarlane, Scotch Hill, Margaree. She had been ill only two weeks, and her death was by no means expected and was a sorrowful blow to her family. She is survived by her sorrowing husband, two sons, Alex D., at home, John A., in Vancouver; and five daughters, Florence, Agnes, and Mary J. at home, Mrs. Murdock McPherson, and Mrs. Dan J. MacFarlane of Boston; three brothers, Dan and Pat at Margaree, John in Flora; and three sisters; Mrs McDonell and Mrs. LeBlanc at Margaree, and Mrs. Haverstock in Edmonton. She had an amiable and cheerful disposition, and had a we circle of friends; all of whom will receive news of her passing with regret and with sympathy for the members of her family. The funeral which was largely attended was held on Friday, March 4. Interment was at St. Margaret's Cemetery, West Lake Ainslie, Rev. John MacPherson. P.P., officiating. R.I.P. [S100] Obituaries from The Casket Newspaper, 1852 - present, Obituary of Mrs. Alexander Cameron, 080-1932-40-5. [S709] Diocese of Antigonish, Nova Scotia, Canada , Marriage record of Alex Cameron & Katie MacDonald, page 457. [S823] St. Mary Cemetery marker, unknown repository, West Lake Ainslie, Inverness, Nova Scotia, Canada, Alexander Cameron, his wife Catherine and their sons Alexander Dan & Daniel. [S895] 1921 Canada Census, Cameron, ID# 0044. Language*: Alexander J. Cameron spoke English. Biography*: Alexander was going to school in 1881. He settled on a farm he bought at Upper West Lake Ainslie. According to the 1891 Census he was living in a two story, four room wooden house. He could both read and write. [S100] Obituaries from The Casket Newspaper, 1852 - present, Obituary of Mrs. Donald (Flora) Cameron, 66-1918-26-5. [S718] Trish LeBlanc, St. Mary's Cemetery, West Lake Ainslie, pages 9-10. [S709] Diocese of Antigonish, Nova Scotia, Canada , Marriage record of Donald Cameron & Flora Walker, page 463. [S655] 1871 Canada Federal Census, 101 Newbury Street, Boston, Suffolk, Massachusetts, USA. Religion*: Donald Cameron was Roman Catholic. Biography*: According to the 1891 Census Donald was a farmer. He could read. He was living in a two story, eight room wooden house at the time of the Census. Both his parents were born in Scotland. [S16] A. D. MacDonald, Mabou Pioneers, Volume I, page 260. Married Name: As of 1818,her married name was Cameron. [S759] Allan J. Gillis, Descendants of Angus "Aonghas Mac Eoghain" Cameron, page 1. [S16] A. D. MacDonald, Mabou Pioneers, Volume I, pp 95, 147, 257. [S1081] Ancestry.com, NS Vital R. - Deaths, Beaton #0047, Book 1018, page 57, number 42.
the United Church of England and Ireland on Earth the Supreme Head. ANGUS Cameron was, by paternal descent, the son of Ewan, son of Dougald, son of Ewan of Achintore, son of Lauchlin Cameron of Suinart. His mother was Margaret Gillis, daughter of Donald of Morar and his wife, Catherine MacGillvray of Arisaig, Scotland. MACLEAN, Raymond A., History of Antigonish, Volume 1, pages 87-88 and Volume 2, page 91, note 31.
a Grandson, The Catholic Camerons of Antigonish County, The Casket, June 2, 1910. [S641] Land Grant to Cameron, Angus et. al. Grant Book A, page 109, Nova Scotia Provincial Crown Lands Record Centre. [S128] The Casket DOF 1913 - Dec. 12 The Camerons, 1913. Religion*: Ewan Cameron was Roman Catholic. Name Variation: Ewan Cameron was also known as Hugh. [S261] Dr. Raymond A. MacLean, History of Antigonish, Volume 1, Page 87. 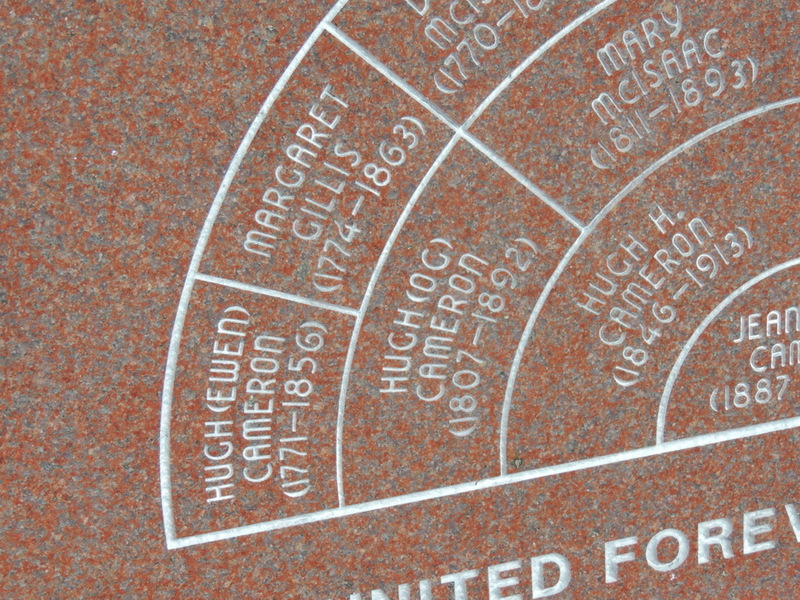 Religion*: Dougald Cameron was Presbyterian. Death*: Dougald died circa 1805 in Scotland. [S261] Dr. Raymond A. MacLean, History of Antigonish, Volume 1, Page 88. Birth*: Ewan was born circa 1715 in Achinore, Inverness-shire, Scotland. Death*: Ewan died circa 1775 in Scotland. Birth*: Lauchlin was born circa 1690 in Suinart, Scotland. Language*: John Archibald MacFarlane spoke English. Name Variation: John Archibald MacFarlane was also known as Jack. [S9] Births, Church Record, June 1977 to September 1944 St. Joseph's Church, Margaree, Records, page 26, line 26. [S878] 1921 Canada Census, McFarlane # 0054. Language*: Joseph Allan MacFarlane spoke English. [S9] Births, Church Record, June 1977 to September 1944 St. Joseph's Church, Margaree, Records, page 30, line 11. [S174] MacFarlane, Hugh S. # 56, obituary, 1941. Religion*: Catherine Jessie MacFarlane was Roman Catholic. Catherine Coady, 99, Margaree Forks died Wednesday, April 5 at Inverness Consolidated Memorial Hospital. Born at Upper Margaree, she was the daughter of the late James John and Jessie (MacDonnell) MacFarlane. She was a member of St. Joseph’s Parish. She is survived by two daughters Helen (Mrs. Donald MacLellan), Ottawa, Barbara (Mrs. Blair McAleenan), Dartmouth; two sons Jim and Larry, both of Port Hauksbury; one sister Rose McNeil, Boston and 17 grandchildren. 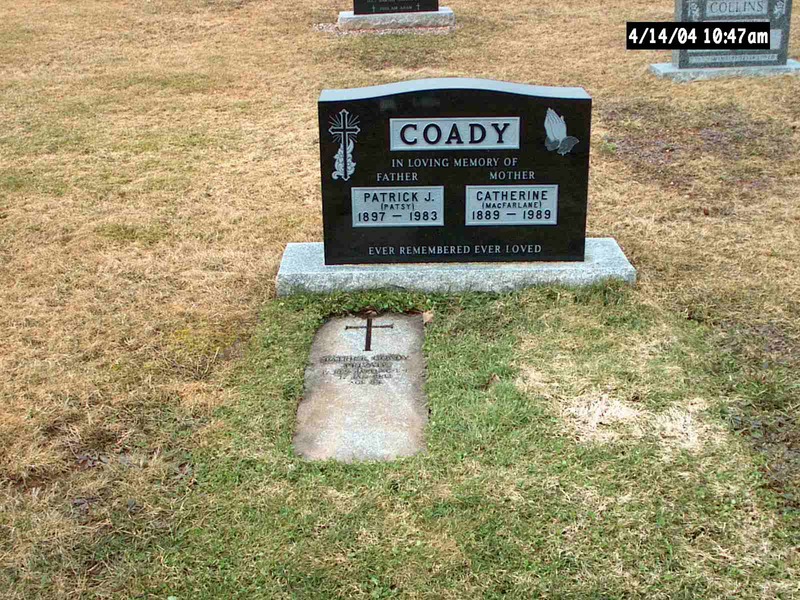 She was predeceased by her husband Patrick and several brothers and sisters. [S489] Donald James MacFarlane, St. Joseph's Church Cemetery, S. W. Margaree, Row 2nd last, plot 8. [S5] Marriage, Church Record, November 1884 to September 1935 St. Joseph's Church, Margaree, Records, page 101, line 3. [S8] Some memories collected by her son Jim on her 96th birthday, Typed document, October 18, 1985 Donald James MacFarlane. [S9] Births, Church Record, June 1977 to September 1944 St. Joseph's Church, Margaree, Records, page 32, line 15. [S9] Births, Church Record, June 1977 to September 1944 St. Joseph's Church, Margaree, Records, page 38, line 11. Religion*: Rose Jessie MacFarlane was Roman Catholic. [S9] Births, Church Record, June 1977 to September 1944 St. Joseph's Church, Margaree, Records, page 40, line 7. 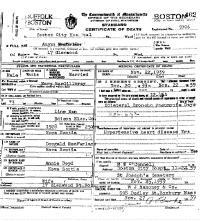 [S443] Hugh Joseph McNeil, Birth Registration 199 (January 5, 1931). [S919] Donald James MacFarlane Border Crossing Card (September 20, 1922), Meredith, Belknap, New Hampshire, USA. [S5] Marriage, Church Record, November 1884 to September 1935 St. Joseph's Church, Margaree, Records, page 101, line 1. [S341] Registration form to Gathering 2001 Committee, August 3, 2001, Sheet 67. 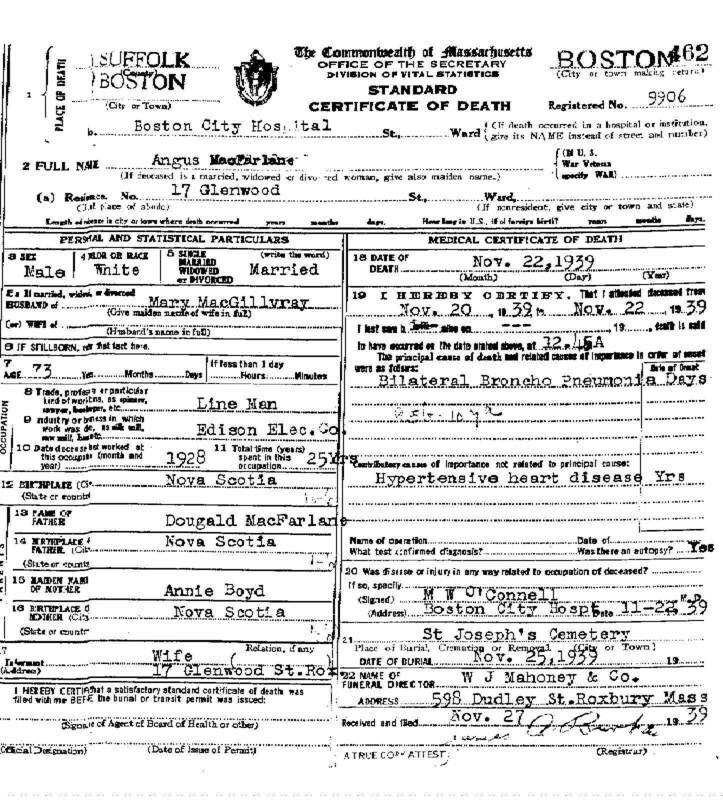 [S444] Barbara Ann McNeil, Birth Registration 11539 (August 13, 1928). [S861] Ancestry.com, online www.ancestry.com, 0861 - 0060 - Rose Jessie MacFarlane.docx. [S175] McNeil, James # 214, obituary, October 1985. [S743] Obituaries - The Patriot Ledger, Obituary of Hugh J. McNeil, May 20, 2011.